Hays, Kansas (Sept 18, 2017) – The University of Kansas Health System and HaysMed today announced Edward Herrman, BSN, MBA/HCM, FACHE, will become HaysMed’s president and chief executive officer. Herrman assumes the position previously held by John Jeter, MD, who announced his retirement earlier this year. Herrman, who is currently president of INTEGRIS Bass Baptist Health Center in Enid, Oklahoma, was selected following an extensive national search. In his current role at INTEGRIS Bass Baptist Health Center, Herrman provides leadership, direction and administration for 207 licensed beds in three non-profit healthcare facilities. Prior to becoming president, he was the hospital’s chief nursing officer from 2008-2011. In 2011, he accepted a nurse leadership role at INTEGRIS Southwest Medical Center in Oklahoma City. He returned to INTEGRIS Bass Baptist Health Center in 2013 to become president. Herrman received a bachelor of science in nursing degree from Oklahoma City University and a master of business administration/healthcare administration degree from the University of Phoenix. Herrman served on the board of directors for numerous community organizations in Enid, including United Way of Enid and Northwest Oklahoma, Northwest Oklahoma Blood Institute, Denny Price YMCA, Vance Development Authority and Enid High Education Council. He is past-president of the Oklahoma Organization for Nurse Executives, and a fellow in the American College of Healthcare Executives. HaysMed’s annual drive-thru flu shot clinic has been scheduled for Sunday, Oct. 1. The event, which will be from 9 a.m. to 2 p.m., will offer free flu shots for all residents older than 6 months. It will be the 18th year the hospital has offered the community service, and approximately 3,500 people are expected to be vaccinated during the free clinic. Adults wanting to receive a free flu shot can get one without having to leave their vehicles. HaysMed volunteers will direct traffic during the event, and the maximum wait time is estimated at 15 minutes. Children older than 6 months will be vaccinated inside the gym at the Center for Health Improvement (CHI). Adults attending with children also can receive their shots inside the waiting area of Hays Orthopedic Institute, located inside the CHI building. More than 100 volunteers will be on hand to help with the event. 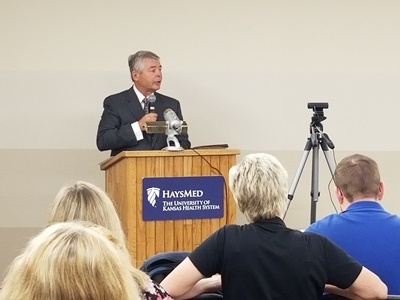 HaysMed partners with Fort Hays State University and North Central Kansas Vo-Tech as both facilities provide students to help with the shots. There will be no nasal flu vaccine at the drive-thru flu shot clinic due to uncertainties regarding its effectiveness. There will be no egg free vaccines available at the drive-thru flu shot clinic. People with a severe egg allergy will need to contact their local healthcare provider for their flu vaccine. The event is sponsored by the Hays Medical Center Foundation. While there is no cost for flu shots, participants are asked to bring a canned food item to benefit the Community Assistance Center. The vaccine also is available at HaysMed clinics for patients who are unable to attend the drive-thru flu shot event. Charges will apply at regular clinic visits, though the vaccine is covered by most health insurance plans. Hays, Kansas (September 14, 2017)— HaysMed, part of The University of Kansas Health System, will present a Cardiovascular/Stroke Symposium on Thursday, October 12, 2017. The program is jointly provided by HaysMed, part of The University of Kansas Health System, The University of Kansas Medical Center Continuing Education and Professional Development and the Area Health Education Center – West. The program will be held at HaysMed in the Hadley Conference Rooms. Registration and breakfast for the program begins at 8:30 am. The program runs from 9:00 am – 4:30 pm. Topics covered include: troponin updates, managing A Fib in a primary care setting, Non-ST-Elevation Myocardial Infarction, update on the Kansas Health and Stroke Collaborative, endovascular stroke therapy, hemorrhagic stroke and falling, and evidence behind stroke core measures. Speakers for the program include: Mohammed Janif, MD, MBBS, FACC; Anil Pandit, MD, MBBS, FACC, M. Javed Ashraf, MD, MPH, MRCP, FACC, FSVM, VACP all from HaysMed; Robert Moser, MD, Kansas Health and Stroke Collaborative; Michael G. Abraham, MD, FAHA, Paul Camarata, MD and Colleen Lechtenberg, MD all from The University of Kansas Health System. The program is designed for Physicians, PAs, APRN’s, Registered Nurses, Licensed Practical Nurses, Social Workers, PTs, OTs and other interested Healthcare Professionals. All participants are required to complete and sign a “verification of attendance” form. After the program, a certificate of completion will be provided to activity participants based on documentation of actual attendance time. Physician: This activity has been planned and implemented in accordance with the Essential Areas and policies of the Accreditation Council for Continuing Medical Education through the joint providership of The University of Kansas Medical Center Office of Continuing Medical Education and HaysMed, part of The University of Kansas Health System. The University of Kansas medical Center Office of Continuing Medical Education is accredited by the ACCME to provide continuing medical education for physicians. The KU Medical Center Office of Continuing Medical Education designates this live activity for a maximum of 6.5 AMA PRA Category 1 CreditsTM Physicians should claim only the credit commensurate with the extent of the participation in this activity. CNE: Hays Medical Center is approved as a provider of continued nursing education by the Kansas State Board of Nursing. The course offering is approved for 6.5 contact hours applicable for RN, or LPN re-licensure. Kansas State Board of Nursing Approved Provider Number: LT0021-1138. Ellis County EMS is an approved as a provider of continuing education for Emergency Medical Personnel. The course offering is approved for 6.75 contact hour applicable for all EMS recertification. Approved Provider Number: pp5800. The fee for the program is $60 for non HaysMed employees, $30 for CAH employees. There is no registration fee for HaysMed, Pawnee Valley Community Hospital and St. Rose Health Center Associates. You can register online: www.haysmed.com/education and click on professional education or registering by calling 785-623-5500. You may pay online with a valid credit card or may choose to be invoiced. Hays, KS (Sept 11, 2017) – HaysMed’s DeBakey Heart Institute has recently established a clinic for people who have peripheral artery disease (PAD). Dr. M. Javed Ashraf, MD, MPH, interventional cardiologist specializes in peripheral artery disease. PAD is a narrowing of the peripheral arteries to the legs, stomach, arms and head but most commonly seen in the arteries of the legs. PAD is caused by atherosclerosis that narrow and blocks arteries in various critical regions of the body. You may be at risk for PAD if you smoke, have diabetes, high blood pressure or high cholesterol, experience pain in your lower extremities, have non-healing wounds of lower extremities or varicose veins. The risk for PAD also increases with age. The PAD clinic can screen, diagnosis and manage patients with suspected or established peripheral artery disease and varicose veins. Dr. Ashraf performs diagnostic and therapeutic peripheral angiograms and vascular interventions including percutaneous balloon angioplasty and stenting. Patients seen in the PAD clinic will receive a detailed comprehensive vascular assessment. Dr. Ashraf works closely with the Wound Healing and Hyperbaric Center with PAD Patients who have non-healing ulcers. For further information or to set up an appointment please call 785-625-4699 or 888-625-4699 or go to https://www.haysmed.com/debakey-heart-institute/pad-clinic/. Hays, Kansas (Sept 11, 2017)- HaysMed, part of the University of Kansas Health System, is a Bronze Level Sponsor of the Hays Out of the Darkness Walk to be held on September 16 in Hays. The American Foundation for Suicide Prevention are the leaders in the right against suicide. They established Out of the Darkness Walks to raise awareness funds that allow the American Foundation for Suicide Prevention (AFSP) to invest in new research, create educational programs, advocate for public policy, and support survivors of suicide loss. The core of the Out of the Darkness Walks, the Community Walks created a movement and are held in hundreds of cities across the country, they give people the courage to open up about their own struggle or loss, and the platform to change our culture’s approach to mental health. The 2017 Walk in Hays will be held September 16 at the Municipal Park. Check in/Registration begins at 12:00 noon and the Walk begins at 1:00 pm. To register or for more information go to https://afsp.donordrive.com/index.cfm?fuseaction=donorDrive.event&eventID=5017 or call 785-543-1963. Hays KS (Sept 6, 2017) – HaysMed, part of The University of Kansas Health Center is highlighting information on Peripheral Artery Disease (PAD) as part of a PAD Awareness month in September. PAD is a condition that develops when the arteries that supply oxygen-rich blood to the internal organs, arms and legs become completely or partially blocked as a result of atherosclerosis (buildup of plaque). PAD can increase the risk of heart attack, stroke, amputation and possibly death. PAD affects 8 to 12 million Americans, which is why September is recognized as PAD Awareness Month. There are many possible side effects of atherosclerosis including angina and heart attacks if the coronary arteries are involved; strokes and transient ischemic attacks if the carotid and vertebral arteries are involved; and claudication, non-healing leg ulcers and critical limb ischemia if the lower extremity arteries are involved. Chronic toe and foot sores are common in people with PAD, as are cramping, numbness, weakness or heaviness in the leg muscles. Many patients with PAD do not experience symptoms. Smoking, high blood pressure and high cholesterol are major risk factors for the development of PAD. Managing these conditions can help improve blood circulation. Exercising can help increase the circulation and reduce pain in the lower extremities. Walking, hiking and bike riding are good exercise options. A personal trainer can help tailor a custom workout plan that best fits a person’s needs. Always consult with a physician about which medications may help PAD and if they are needed. In some severe cases of PAD, surgery may be needed to open arteries that have narrowed. Consult with a physician to see if surgery is a necessary treatment. For more information about PAD and treating chronic wounds, contact the Wound Healing and Hyperbaric Center at 785-623-5602 or go to www.haysmed.com/wound-center/. Center has been outstanding. Please keep up the fine work! *The staff was very professional and helpful. I felt that the nurses were very good. care and timing I am able to write this today. Thank you all! felt well cared for and comfortable. was here and also very impressed with Dr. Hemphill. She is an excellent doctor. out anyone in particular but “Trish” is one person who excels in all she has done for me in the past. great person to have at your facility. am missing someone but all were great. deepest thanks go to all your staff—their training is very evident. *Exceptional care, very kind, very, very satisfied. Mark in CT I want to recognize. feel safe and informed about what they are having to deal with. You are all appreciated. *Kaitlin was great and very informative. interested in answering all my questions. *Everyone was very nice and professional. Amanda RN was excellent and compassionate. *All the nurses and PCTs who helped care for me were wonderful. I can’t remember their names. member of HaysMed staff was so professional and kind. I can’t imagine a finer hospital anywhere. Thank you all. Five stars for all my caregivers. * ”Thank You” I feel I had the best care that could be given. Everybody was patient and friendly. nurses and everybody here, are the best. Why go some other place? start to finish. I would definitely refer everyone needing pain management to Dr. Green. friendly, courteous and always have a smile to share I appreciate their help. good to know that the people taking care of you know what they are doing and are good at their job. very good care of me. Sonja was also a great nurse. with the handling of my care. help getting me back to good health. *Very pleased with the cardiac care and instruction of Carmen and May. Very Professional! of the Breast Care Center of HaysMed. Breast Care Center. Really set my mind at ease. All questions answered. Very pleased! you all keeping the appointments right on time! *They made it so much fun and did a wonderful job—it helped me a lot. Allison gave me excellent care. improvements in pain reduction as well as mobility. Thank You. in my rehab. This is a great facility and look forward to coming back for more exercising. the therapy last fall and more strength and relief in my back and foot during this 12 session therapy. model traction machine for me. I am so grateful. 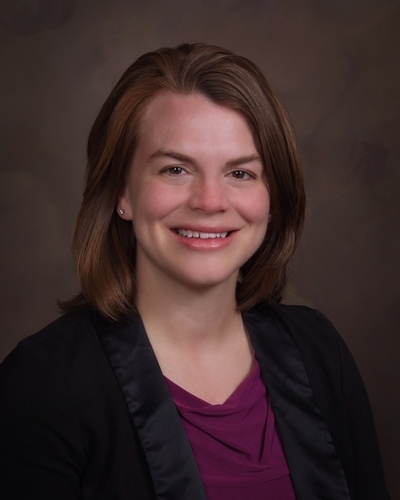 Hays, KS (Sept 5, 2017) – Dr. Jenna Sloan, OB/GYN, has recently joined the Medical Staff of HaysMed, part of The University of Kansas Health System. Dr. Sloan grew up in Hoxie, Kansas and received her medical degree from The University of Kansas School of Medicine in Kansas City, Kansas. She completed a residency in OB/GYN at Baylor Scott and White Memorial Hospital in Temple, Texas. Dr. Sloan joins Drs. Joel Fort, Lee Hodny and Timothy Hoskins at the Center for Women’s Health and will be seeing patient both in Hays and St. Rose Health Center in Great Bend. To schedule an appointment call 785-623-5806.